Still trying to pick a New Year’s Resolution? How about one that is easy and free and can make you healthier, smarter, less stressed, and happier? If the name of the column didn’t already give it away, we’re talking about getting more sleep in 2019. So why is Safety Matters concerned about how much sleep you get? Because, in addition to improving your overall wellbeing, getting the right amount of sleep makes you safer at work too. A report published by the National Safety Council estimates that 13% of workplace injuries can be attributed to fatigue. It’s an even bigger factor in fatal automobile accidents. Some of the biggest industrial accidents in history have been blamed, at least partly, on worker fatigue. Human error and fatigue factored into the partial meltdown of Three Mile Island, the Exxon Valdez oil spill, and the Union Carbide disaster in Bhopal, India. The United States Department of Transportation (DOT) has long recognized that fatigue plays a critical role in workplace safety. 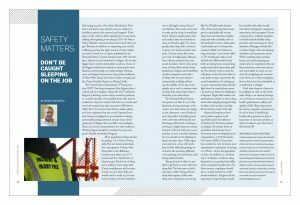 The DOT addresses fatigue by limiting certain safety-sensitive positions to a certain number of acceptable hours that may be worked in a day, how many total hours in a week, and even how many hours they must have off between shifts. But it is not just truck drivers, airline pilots, and train engineers that are at risk. Impaired reaction time, poor judgement, poor decision making, and trouble paying attention are just some of the symptoms of fatigue that can affect any workplace. These are not the characteristics of a safe workforce. Worker fatigue should be considered in any company’s Health and Safety Program. Most people know they should be getting 7 to 9 hours of sleep daily. But not many understand the consequences of sleep debt. Sleep debt is the difference between your sleep need (7–9 hours), and the actual hours of sleep you get. Each hour of sleep lost is added to your sleep debt. If each workday you add another 2 hours to your sleep debt, you would need to make up 10 extra hours of sleep over the weekend—over a full night’s sleep. Even if you did have that much extra time to make up the sleep, it would just throw off your regular sleep cycle and make it that much harder to sleep on Sunday night. For many people, that sleep debt continues to grow over weeks, months, and years. Chronic sleep debt raises your risk of weight gain, diabetes, heart disease, memory loss, and mood disorders. Short-term symptoms of sleep debt include fuzzy-headedness, fatigue, and irritability. Another dangerous side effect of sleep debt are microsleeps—momentarily nodding off during the middle of the day. Some people are in such a constant state of sleep debt, they forget what it feels like to be well-rested. The National Sleep Foundation points out that it is not that big lunch, boring meeting, or the warm room that makes you sleepy in the afternoon—more likely it’s your sleep debt. A healthy person with a low sleep debt should not feel sleepy after lunch or during a meeting. A slight afternoon slump between 1:00 and 3:00 p.m. is normal due to your circadian rhythms, but you should not be fighting to keep your eyes open. Other signs you may have a sleep debt problem include difficulty getting out of bed in the morning, difficulty concentrating, low motivation, and being easily irritated. The good news is that it is possible to get back on track with your sleep debt. The bad news is that it may take a while. Paying off your sleep debt requires a little extra sleep over a long time, not one big Rip Van Winkle–style slumber. One of the most important strategies is to gradually add to your sleep time and maintain a regular sleep and wake schedule, even on the weekends. Create a dark, quiet, comfortable, and cool sleep environment. Make your bedroom a sleep sanctuary—not a home office or TV viewing area. Also, avoid alcohol and caffeine before bed, both can disrupt your normal sleep cycles and result in poor sleep quality. You will also want to leave the cell phone on the bed side table (or even farther away). Apart from the mental stimulation of catching up on your social media feeds, the blue light from the smart phone screen can trick your brain into thinking it is daytime. Night shift workers can use blackout curtains or wear a sleep mask when sleeping during the day. A white noise machine can help block out the sounds of the day. Almost all employers have strict policies against working while under the influence of alcohol, but few have policies on fatigue. Yet studies show an equivalent risk between the 2. Seventeen hours of sleeplessness is comparable to a 0.05 blood alcohol content (BAC). If you have been awake for over 24 hours, your impairment is equivalent to having a 0.1 BAC—above the legal limit to drive. In addition to contributing to workplace accidents, sleep deprivation is a productivity killer and an employee health issue. For these reasons, employers should have a vested interest in a well-rested workforce. Fatigue and the importance of good sleep should be included with other health and safety training for employees, supervisors, and managers. If your company has a wellness program, it should include healthy sleep practices and screenings for sleep disorders. Managers should also consider fatigue when developing schedules and manpower needs. When working long overtime hours, you may be paying premium rates for employees who are less productive, more error prone, and more likely to cause an accident. Poor lighting and excessive noise levels are 2 other workplace factors that have been identified as contributing to fatigue. Don’t view sleep as a luxury to be indulged in only on the weekends. Sleep is an essential biological need that is necessary for your health, performance, safety, and quality of life. Sleep deprivation has serious negative consequences for all of these. Establishing healthy sleep practices is just as important as exercise and diet, so why not make it your New Year’s Resolution? This article was published in the January 2019 issue of Insulation Outlook magazine. Copyright © 2019 National Insulation Association. All rights reserved. The contents of this website and Insulation Outlook magazine may not be reproduced in any means, in whole or in part, without the prior written permission of the publisher and NIA. Any unauthorized duplication is strictly prohibited and would violate NIA’s copyright and may violate other copyright agreements that NIA has with authors and partners. Contact publisher@insulation.org to reprint or reproduce this content. 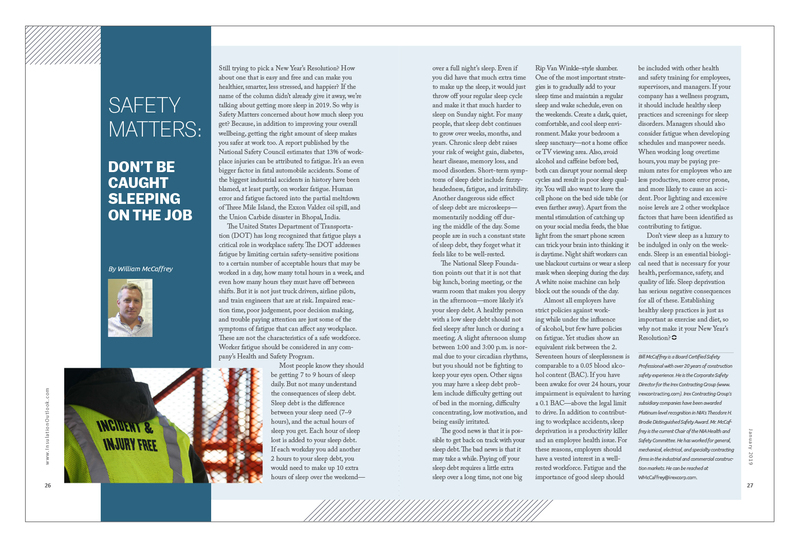 Safety Matters: Are You Experienced?